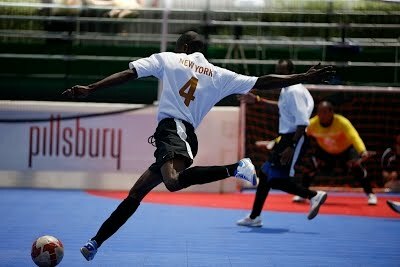 Street Soccer New York City continues its league play this Friday night at Chelsea Piers, located at 23rd Street and the Hudson River. The team has had a very competitive season so far, falling last game 10-9. Please come out and support the team this Friday. Enter at 3rd Street off Prospect Park West Avenue and walk toward the small path past the enclosed kids playground. Continue up the small hill, and to your left you'll hit the park road. Turn right on the park road for and walk until see a park sign for the Picnic House on your left. We play just below the picnic house. All women.